These games for girls work best when you're babysitting sisters or girls who have friends over--in other words, boys typically aren't interested! Depending on their ages, though, you may be able to entertain girls with these games and boys with their own games simultaneously. 1. Hand-clapping games remain popular, and this classic is one of many games for girls that most girls don't know. You take the J-E-L-L-O '80s commercial, memorize the chorus lines and tune, and stand in a circle facing in with all who are playing. Each player's hands are out to her sides with palms up. Each player's right hand "rests" on the left hand of the player to her right. The leader begins to sing the J-E-L-L-O song and starts the hand game by GENTLY "clapping" her right hand over to the player to her left's right hand, in time with the song. When each player's hand gets "clapped," she claps the person to her left. This goes in a circle until the end of the song, in which each letter of the word "J-E-L-L-O" is its own hand clap, and the person who gets clapped on "O" is out. 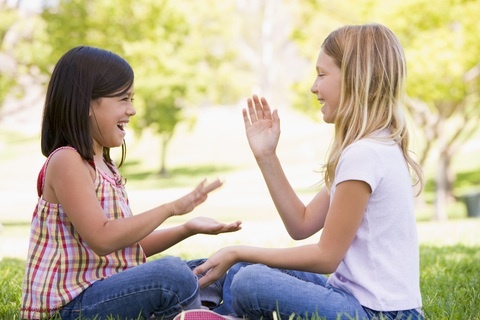 Hand games for girls are light-hearted and fun and can be played indoors, outdoors, or even in the car. 2. Write a book. Seriously! Not all games for girls are strict games by definition. 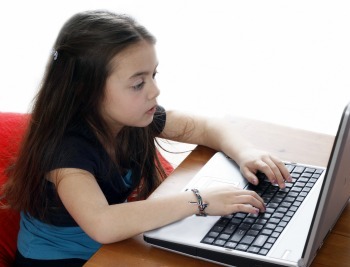 You can help the girls write a book on the computer or on paper. You can start with the girls telling the story out loud and writing down notes, or having them start by brainstorming, or just start writing the story. If one of them can draw, fantastic. If not, you know how to search for images online. Without being too teacher-like, guide the children, letting their imaginations lead. If they are the type who enjoy learning, you can gently correct spelling, or help with a table of contents. And they'll likely ask you for help. Just don't make it seem like homework, or they'll lose interest. One way to get them interested in the first place is to have them think of who they'll give--or read--the book to. It could be younger siblings or neighbors, their parents, or even you. Don't forget the fun part: creating the actual front and back cover with construction paper or even typing paper. Depending on their attention span, you can look up neat templates online for the entire book or just for the front and back covers. You probably won't finish an entire book while babysitting, but this is one of many academic games for girls. 3. Design a scavenger hunt. They'll get so caught up in the "how to get there" that they may never reach the end, but if you can teach them how to do it with the end in mind (in other words, when writing down the scavenger hunt clues, they should probably already know where the prize is hidden), they may actually complete the task! Scavenger hunt games for girls can be formulated for indoor or outdoor fun. Outdoors may involve more obstacle course-type clues ("leap over the tree trunk, then take four giant steps forward, etc.") Obviously if the girls aren't interested in writing it down, you can do an impromptu scavenger hunt, where you hide an object, then via your own verbal clues, you'll send the girls all over the house or the yard until they finally reach the prize. If the girls write the clues, teach them how to send each other from one clue to the next, until all the clues are found and they've reached the prize. There are hundreds of games for girls, but the ones that involve their minds and athleticism tend to be most rewarding. 4. Bake a mystery cake. This works best when there's already a boxed cake mix (or several, so you know you're not using up somebody's upcoming birthday cake mix) in the pantry. The object will be to actually make something edible so it isn't a waste of food, but allow the girls to be inventive about what they want to put in the cake. Look through the pantry for items that will spark their interest: pretzels, peanut butter, M&Ms, powdered sugar, marshmallows, a banana... anything you know won't absolutely ruin a cake. Help out by monitoring the portions of each item (the less the better!) 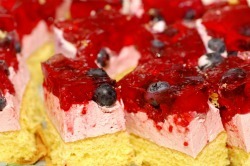 but try to allow as many items as possible to go in the batter. Cross your fingers and hope it's edible! Try adding in something that starts with each letter of the alphabet as a game for the girls. *Another fun item to put in a cake is coins! This requires aluminum foil, and you just tightly wrap each coin in it, then drop the coins in the batter, and bake away. Just keep them in mind while cutting the cake. The girls will have a blast doing this, especially if they decide to make the mystery cake a secret until dessert time! Note: do not use dollar bills. Only coins! 5. Put on a play. The easiest and most fun thing to do here is design the stage first, then, instead of writing down lines, just act out a Disney movie or any film or book the girls have seen or read. You may have to help them pick parts (in case both want to be a princess...) but they'll love picking out their costumes and being on stage. If one of the girls is shy or doesn't want to be an actress, she can do the lights (think flashlight for spotlight) or be the director. If you have a minute, google the script of the movie the girls want to act out and see if it's available. You can print a few copies, highlight their lines for them, and go from there. The girls will either have to play more than one part, of you can read (in character, of course!) all the characters other than the ones the children are acting out. 6. Talent show! Many girls are involved in cheerleading, gymnastics or dance of some sort. Ask if they'd like to put on a performance using an existing routine or one they've made up. Of all games for girls, this is the best for leading into a talent show, complete with programs, listing out the performances and name of each girl. If they aren't involved in group activities like that, help them think of other talents, like hula-hooping, balancing on one foot, singing, speaking in another language, etc.